who want to write an inspiration-blogpost or tutorial. There were quite some reactions on my call, but most came from Dutch crafters and since I want to offer a various ‘mix’ of guests, I would love some ‘foreign’ (non-Dutch) artists/crafters to submit. I can think of many of you “deskers” that would be able to offer an inspirational blogpost for this Summer series… come on my friends, don’t let me down! 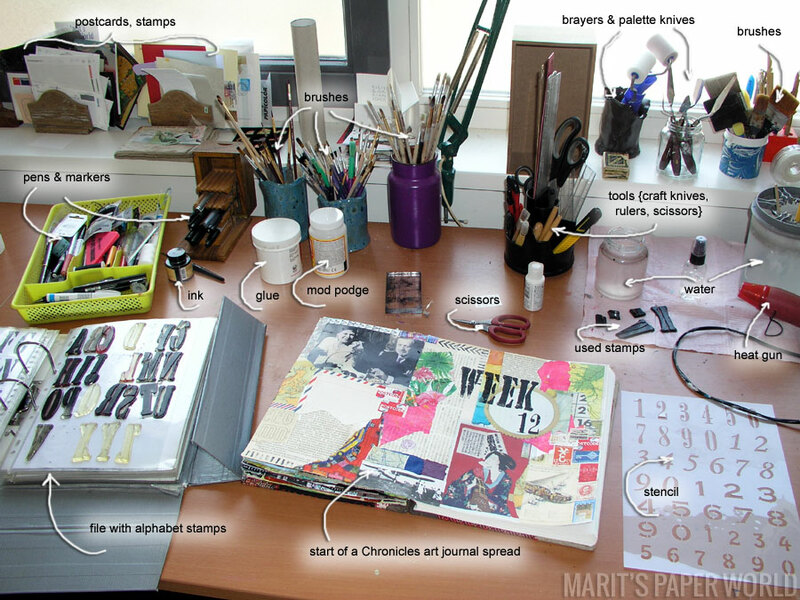 I always clean up after creating, so the photo I take on Wednesday morning almost always shows a neat desk. I am used to taking a ‘morning photo’ but I might change that and take the photo for What’s On Your Workdesk Wednesday on Tuesday-afternoon from now on… a photo taken in the midst of creating shows more interesting things for you to see… agree? My first thought was to turn this into a ‘collage journal’ but I’m not sure… once I decide on a theme for this journal I might add a title to the cover. And that’s it for today folks, but before I sign off I’d like to have big CHEER for my beloved, who deep-cleaned the bathroom while I was playing in my atelier. 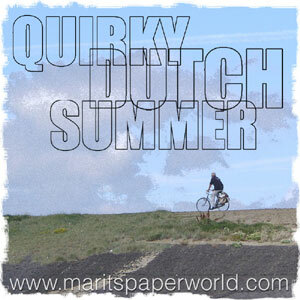 Thanks for stopping by my blog, have a lovely week and don’t forget to check out the call for guest-bloggers… see ya! 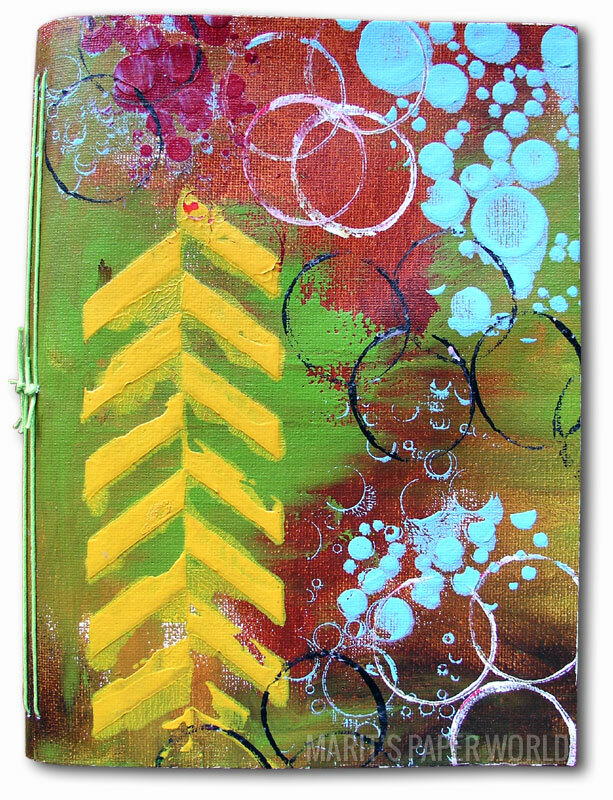 I love your canvas journal cover, it’s a fabulous and versatile material. I buy canvas sheets in a pad and use them for all sorts of things especially in my textile work. A beautiful share Marie has great taste. Love the canvas tip and the results you got with it…I have several canvasses that as yet I’ve not used so there may be a new use for them….thanks for passing on the tip. Oh Marit, can you hear me cheering? I hate that job and he’s definitely worth keeping! I hardly ever take a photo on Wednesday mornings, Marit – they’re nearly always pictures of what’s been going on during the past week. As I only blog on Wednesdays, I think that’s allowed! I love the bright colours on your canvas, really cheerful! Hi Marit, I love the colours on your journal. I have some ring binder notebooks and can’t make my mind up what to do with them. Your canvas cover is great, Marit. Sorry the stamp tore – that’s sick-making. I often think glues are too sticky. Recently I’ve been having major problems opening certain food packaging for the same reason – the “peel and re-stick” ones just won’t peel! Thank you for your visit and I’m sorry you couldn’t see my photos. I think it’s google messing around again. I can see my own blog post properly, but this a.m. couldn’t see Julia’s photos on the iPad, but I could on the laptop. Could I suggest trying again later? In this household I do the laundry, ironing etc. and I’m also the computer buff but I’m hopeless at helping my hubby because I get cross with him for not listening – I have told him at least 4 times how to do certain things and said I wouldn’t tell him again haha!! I try hard to resist buying clear stamps as some of them are just so sticky and as you say, tear, although I don’t think I’ve had any that have done that. I love your journal, it is gorgeous! Just to let you know I’ve re-posted the photos from yesterday’s blog post, and hopefully you will be able to see them now. Lovely journal pages, such fresh and vibrant colours, and I love the book cover – what a great idea, and so effective. What a shame your stamps tore, I haven’t had that happen but i’ll certainly be more gently with mine in future! !